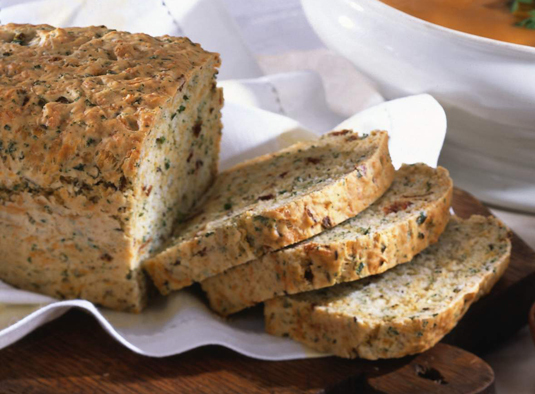 When you make this easy beer bread recipe, you’ll smell the tantalizing scent of bacon and scallions as it bakes. Flecks of green parsley and yellow cheddar add visual appeal. This beer bread is a delightful addition to breakfast, lunch, or dinner menus. It’s best fresh, but can be frozen. Preheat the oven to 350 degrees F. Lightly spray a 9-x-5-inch loaf pan with nonstick cooking spray and set aside. In a medium bowl, combine all the ingredients except the beer. Make a well in the center of the dry ingredients. Slowly pour in the beer and stir with a wooden spoon until just blended. Pour the batter into the prepared pan. Bake for 50 to 60 minutes or until a toothpick inserted into the center comes out clean. The top of the bread will be lightly golden and have a rough appearance. Make whole wheat beer bread. Use 2 cups white all-purpose flour and 1 cup whole wheat flour. Avoid dark beers, which make the bread taste bitter. Per serving: Calories 191 (From Fat 56); Fat 6g (Saturated 3g); Cholesterol 16mg; Sodium 354mg; Carbohydrate 26g (Dietary Fiber 1g); Protein 8g.